ICVT did an amazing job. Just take a look at the examples on their website and you’ll agree. Despite heavy size reduction all the images don’t show any signs of pixelation or other quality losses. At least not as long as you don’t zoom in several hundred percent. According to ICVT, the underlying algorithm works similar to the visual perception of the human eye. After being heavily downsized the images still stay standard JPG and as such can be viewed in any available browser, editing software and else. This is the biggest advantage over similar technologies such as JPEG2000 or Google’s WebP. 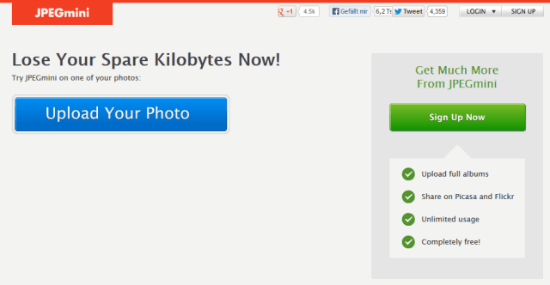 If you want to try it for yourself, you should upload a single photo via their website and see what you get. 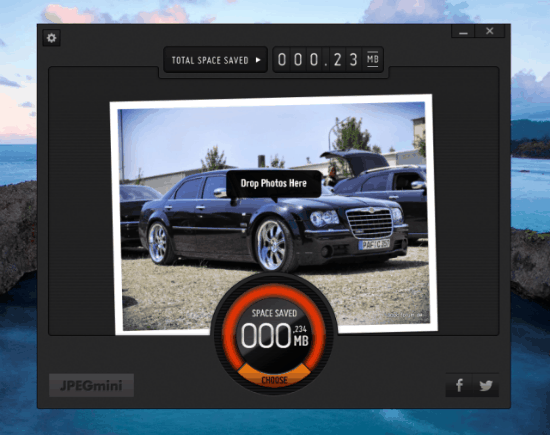 You can even compress whole batches of photos, but this requires you to create an account at JPEGmini.com. Did you decide to register, you will find a remarkable free feature set. 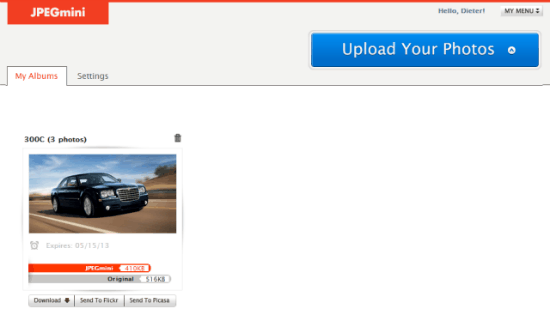 You are able to upload your photos or whole folders to so-called albums, which will be downsized straight after upload. Each album is designed to contain up to 1,000 photos representing a cumulated file size of 200 MM. The number of albums is not limited. 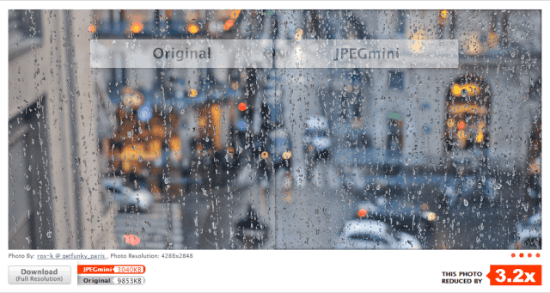 You need to keep in mind though, that JPEGmini is not designed to be a replacement of image services in the likes of 500px, Flickr or Picasa. Uploaded albums will expire seven days after their creation. The expiration date is clearly shown on the album’s thumbnail. Below each album you are invited to choose any combination of the given possibilities as there are the download of the entire album in the form of a zip-archive to your desktop, the upload to Flickr, or the option to store the album as a Picasa Web Album. Inside JPEGmini it is not possible to access individual images. In 2011, after the service had been started, ICVT focused on licensing the technology to third parties. The web app seemed to be intended more as a proof of concept and a valid reference application. It might be safe to say that these ambitions did not turn out to be successful, which probably was for the better, as ICVT then started developing their own products based on the algorithm. First they made Mac users happy with the release of an app for Mac OS X which at initial publication went out free of charge. 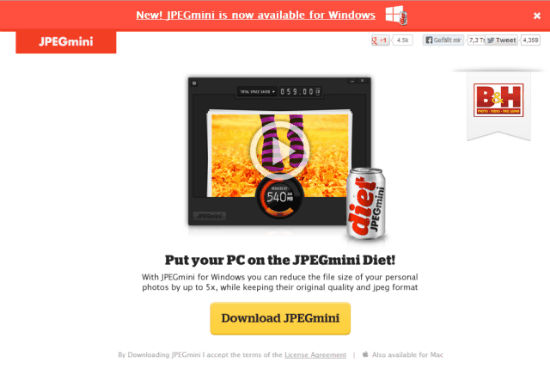 Today, you can still obtain a free version of JPEGmini for Mac. 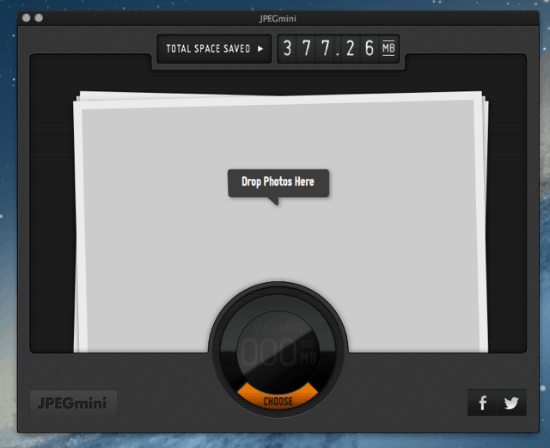 Called JPEGmini Lite, this version allows you to downsize up to 20 photos per day. The full version sets you back USD 19,99 and does away with this limitation. JPEGmini for Mac is deeply embedded in my editorial work-flow. Each and every JPG gets mangled through the mills of the tool. There be no mercy. Hundreds of MB have been held away from the browsers of the readers of our magazines that way. As I live in both worlds, I tend to swing between working using a Mac and a PC. Being at the PC I did miss JPEGmini painfully more than thrice in the past. To avoid having to use the web app which naturally slows down your work-flow, I tried to schedule articles in a way that left me time to prepare the images using a Mac’s JPEGmini. This did work fairly well, yet was uncomfortable. Two days ago ICVT released the Windows version of JPEGmini. I admit I jumped for joy. At the time being there is no Lite version for Redmonders, instead we have to shell out 20 bucks straight. But, believe me, the software is worth every single penny of it. Don’t look for too many differences between the versions for Mac and Windows. They resemble each other closely, though the Windows version does come over slightly less elegant, less polished. Don’t blame ICVT, Windows simply does not have anything similar to Apple’s Core Animation. One more thing you are likely to notice is the amount of time it takes until the software is ready to process. The Mac version starts much faster. Obviously this is only perceivable if you own both versions. More importantly, when it comes to the speed of processing and the quality of the results the two are totally equal. Both versions accept JPG files with maximum resolutions of 28 MP. Oftentimes the question is asked if there will ever be a JPEGmini Photoshop plugin. The answer is no, at least not in the foreseeable future. The beginning of April 2013 saw the release of JPEGmini Server, a cloud-based web service for clients with lots of images. The software can be self-hosted or used via Amazon Web Services. If your company or organization sees a need in the daily processing of a real lot of images you should definitely take a look at ICVT’s offering. Server as well as web app accept images up to 50 MP in resolution. Conclusion: If Photoshop is more or less your desktop on which you work all day long, you will probably not find a lot of benefit in JPEGmini. Combining Photoshop’s powers cleverly will let you achieve similar results. If you need to quickly and reliably shrink a notable number of images, JPEGmini will be faster. If you don’t own Photoshop, JPEGmini’s price tag of 20 USD should have you convinced in no time. My work-flow relies heavily on JPEGmini even though I do possess a license of the latest Photoshop. Does that say enough? After having written this article I contacted ICVT to see if I could do our readers some good by offering a few licenses to win. The folks at ICVT responded almost immediately and donated five licenses, which we are going to give away now. Our little game starts now and runs until May 13th, 6 PM (UTC +1). The five winners will be drawn at random from all correct answers. Good Luck! Are the results going to be published or are only the winners of the licence going to know by mail that they won ? Congrats. You will be contacted by ICVT directly. Same question. Any results will be published? Oh, sorry, I didn’t see comment above for some reason. Thanks a lot for the article . Its really healpful . Will stay tune for more :) .